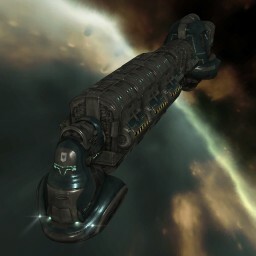 Most of my characters in EVE Online rely on manufacturing, hauling and trade to earn income. As a result, two of them fly industrials more than any other ship type. When not flying a Charon freighter or an Orca mining support ship, my Amarr alt will usually be found in a Prorator, the superb blockade runner. It's fast, and a great ship for quick shipping runs. She also isn't unfamiliar with the inside of a Sigil or Bestower, both of which have been very handy for carrying stuff around from time to time. My main character, Neville Smit, also flies a blockade runner - the fine Viator. For hauling runs requiring some extra capacity, Nev undocks in an Iteron Mark V.
Early in his EVE career, Nev made some decent amounts of ISK as a hauler in high sec space. I became intimately familiar with the entire Iteron line of "ugly green tube" indys. After some experimentation, I wrote a special guide on how to haul profitably. After four years, I still enjoy sharing my unnatural affection for industrial ships, teaching the "Hauling 101" class to new EVE University students. So, it was with both trepidation and eagerness that I anticipated the release of the Odyssey 1.1 update this week, which included the results of the latest re-balancing changes to industrial ships. Most of all, I was very eager to try the metamorphosed Iteron Mark II, III and IV models, which are now specialized hauling vessels. Each race now can fly an indy that emphasizes cargo carrying over defenses, and another that is designed to be both tanky and agile but with less capacity. DPS is 143, and it runs cap stable with the booster - which you may need since it might take a while to bring down a target. The shield buffer tank is over 20K EHP, and the afterburner provides a respectable 406 m/sec in speed. Sneak up on your unsuspecting target, maneuver into a 9K orbit, scram and web them down and let your drones and the medium railgun (which also got a boost in Odyssey 1.1) go to work. Similarly, the revamped Badger now can be fit with both a missile launcher and a turret, providing for comedy indy combat fits there, too. I've already started reading complaints in the EVE Online forums from some "PvP elites" (a.k.a., gankers of industrial ships) that the indy re-balance now makes these ships "overpowered" - that is, much tougher to kill. I must say I have to agree, but only to a point. The max cargo Bestower fit listed above, for example, has only 7,815 EHP. There are still some fat, thin-skinned indy targets out there. Gankers will now have to think a bit before they dive indiscriminately on any industrial target. This is good, in my opinion - EVE should always be about making the right choices, or paying the consequences for making bad ones - whether you are an indy pilot or a ganker. My obsession to own at least one of every ship in the game means that I kept at least one of every kind of Iteron, including the Mark II, III and IV models. These are now all specialty ships, with dedicated bays for hauling specialized cargoes. Similarly, the old Minmatar Hoarder also features a specialized bay, too. The warp core stabs provide some protection against tacklers, and EHP is decent at 17,550. Align time is still relatively slow, however, at 8.2 seconds, despite the nanofiber module and rigs. Still, this is going to be very handy for shuttling output from mining barges and exhumers to stations. Suddenly, jetcan mining is viable again! My fits for the Epithal planetary interaction hauler and for the Kryos mineral indy are very similar - nanofibers, WCS, large shield extender (either Tech II or Meta 4), resistance amplifiers, and an invulnerability field, with rigs for agility and more shield capacity. I think that represents a nice balance, but I'll be interested to see what kinds of experimental fits others come up with, too - please post yours in the comments! So, has the industrial re-balance succeeded? I have to give CCP's efforts an enthusiastic two thumbs up. The revamped line-up of haulers provides some great choices for players, and are all a boon to industrialists like me - and a potential bonus to those who like to prey on indys, as well, if they are smart about picking the right targets. The potential for indy PvP fits will provide some comedic moments, too. And finally, the specialized industrials are simply genius - they will be obvious targets, but they are going to be very handy for moving specialized items effectively. Posted in Fitting, Commentary and tagged with Eve Online, industrials, fitting. September 4, 2013 by Neville Smit.